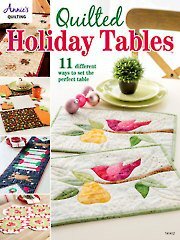 Quilted Holiday Tables is the perfect solution to every quilters needs for holiday specific patterns. The 11 gorgeous table runner and place mat patterns in this book are trendy yet easy. Pattern templates are provided on a 30- x 21-inch insert. Tutorial sidebars included are: Fussy Cutting, Padded Applique, Paper Piecing, Raw-Edge Fusible Applique, Foundation Piecing and Quilting Basics.